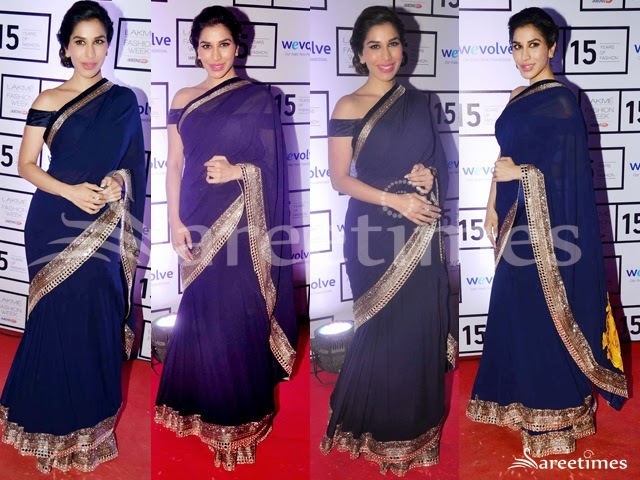 Sophie Choudry at India Couture Week 2015 in a designer saree by Manish Malhotra. Cream saree paired with a sleeveless V necked blouse. 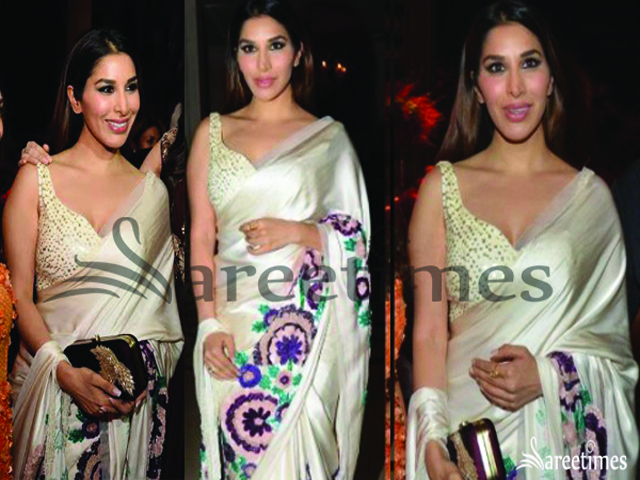 Sophie Choudry at Lakme Fashion Week Resort 2015 in Satya Paul printed saree. 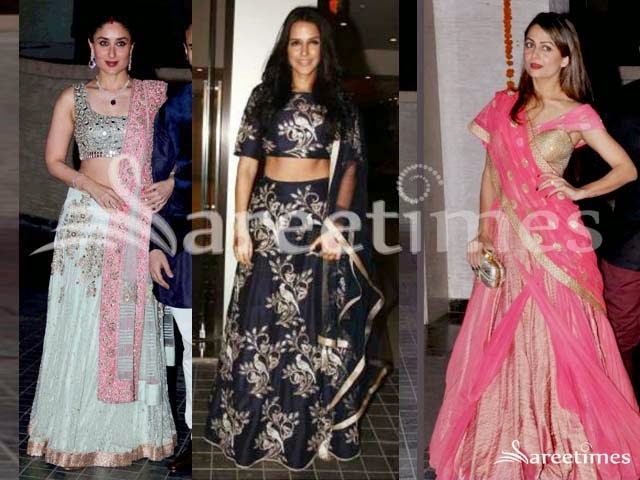 Actress Kareena kapoor, Neha dupia,Amrita Arora, Konkana sen, Sophie choudary, Sandhya Mridul in designer sarees and lehengas at Soha Ali Khan-Kunal Khemu's wedding reception. 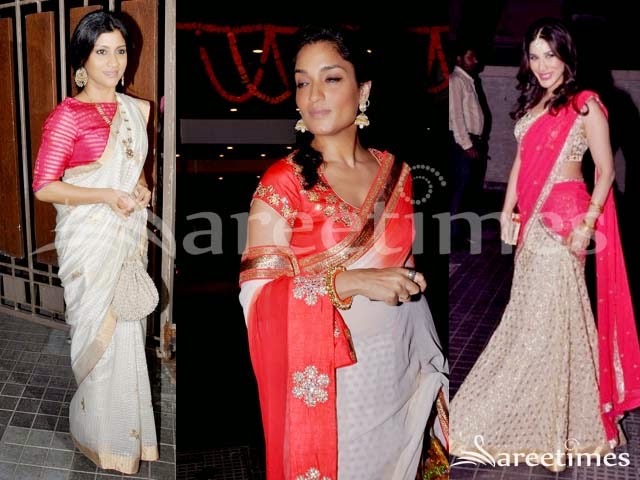 Sophie Choudhary at Soha & Kunal Wedding Reception wearing a gold and pink lehenga designed by Anushka Khanna. Bollywood actress Sophie Chaudhary attended Sonaakshi Raaj Store Launch. She was looking beautiful in red Sonaakshi Raaj saree. Paired with designer embellished sleeveless saree blouse. Bollywood actress Sophie Chaudhary at Ekta Kapoor's Diwali Bash. She picked Manish Malhotra Lehenga. Embroidered work all over lehenga and double unique border. It is a peach georgette dupatta with embroidered border. Contrast with maroon short sleeves saree blouse with wound neck pattern. Bollywood actress Sophie Chaudhary in beautiful black,green and grey designer tricolor embellished saree. Designed by Shaina NC at Pidilite CPAA Show 2014. Border is highlighted with gold polka dots,embroidered sequins buttes and patch work. Paired with designer short sleeves saree blouse with wide neck pattern. Bollywood actress Sophie Chaudhary in beautiful white and green half and half saree. Designed by Vikram Phadnis at Swades Foundation Event. Gold embellished applique patch work designs through out border. Paired with designer embellished 3/4th sleeves saree blouse with wide neck pattern for back. Bollywood actress Sophie Chaudhary in beautiful white embellished lehenga. Designed by Manish Malhotra at Manish Malhotra’s Men In Mijwan Show. Black embellished applique patch work designs through out pink border,followed by black,gold borders. It is a white embroidered netted dupatta with patch work border. White embellished patch work designs all over dupatta. Paired with designer embellished mini sleeves saree blouse with wide neck pattern. Bollywood actress Sophie Chaudhary in beautiful blue designer plain saree drape. Designed by Sonaakshi Raaj at Day 4 LFW Summer/Resort 2014. Paired with designer embellished sleeveless saree blouse for back. Bollywood actress Sophie Chaudhary in beautiful pink and black designer half and half saree. Designed by Manish Malhotra at Screen Awards 2014. It is a black net fabric. Gold embellished temple designs patch work through out border. Followed by thread work. Paired with designer sleeveless saree blouse. Bollywood actress Sophie Chaudhary in beautiful tan designer bridal lehenga. Designed by Mandira Wirk at Aamby Valley India Bridal Fashion Week 2013. Heavy embellished applique patch and gold thread work all over lehenga and tricolor border. It is a embroidered dupatta with patch border. Paired with designer embroidered shoulderless saree blouse. Embroidered mirrors and kundans all over blouse. Bollywood actress Sophie Chaudhary in beautiful black and half white designer half and half saree at Mandira Bedi’s Store Launch. Gold embroidered zardosi work all over saree. Gold zari work through out border,followed by plain borders. Paired with black designer sleeveless saree blouse with square neck pattern. Bollywood actress Sophie Chaudhary in beautiful red and black designer half and half saree at Zayed’s Wedding Reception. It is a georgette saree. White polka dots all over black. Embroidered mirrors and patch work through out border. Paired with black designer spaghetti strap saree blouse. Bollywood actress Sophie Chaudhary in beautiful bridal lehenga. Designed by Rina Dhaka at Rina Dhaka’s Bridal Show in Delhi. Green and orange checks all over lehenga. Thread work around it and embroidered mirrors on it. It is a peach designer embroidery netted dupatta. Mirrors all over dupatta. Paired with designer embroidered spaghetti strap saree blouse. Embroidered mirrors highlighted on it. Bollywood actress Sophie Chaudhary in beautiful red and white designer dual color plain saree. Designed by Vikram Phadnis at Day 4 LFW Summer/Resort 2013. Gold embellished crystalized glittering work through out border,followed by yellow border. Mirror work on it. Paired with designer backless saree blouse.